Nike has long been lauded for pushing the elements of style and technology and incorporating them into their basketball sneakers. Eight years ago, the Nike Hyperdunk was a revolutionary model because it introduced the world to Flywire, the tensile fibers that make up the skeletal framework that make up a shoe. The resulting shoe was lightweight and promised to change the direction of shoe design and manufacturing. 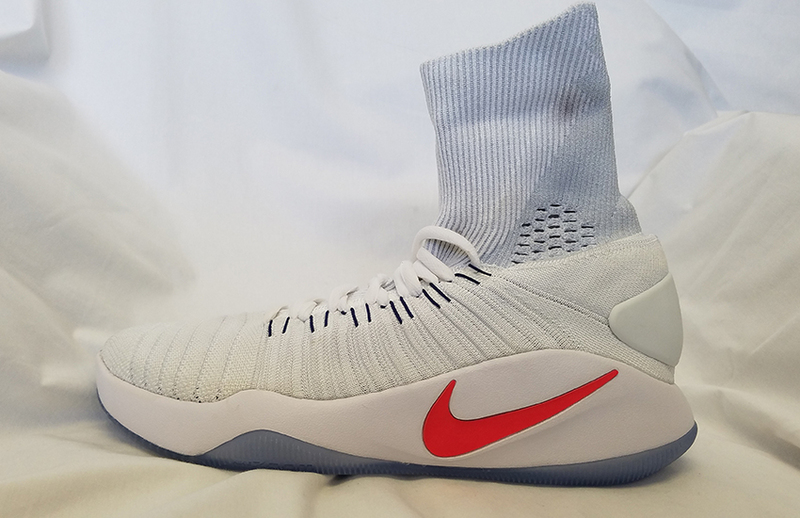 Originally slated to be Kobe Bryant’s signature model, the Hyperdunk was billed at the time as one of the lightest basketball shoes on the market and more than 100 athletes during the 2008 Summer Olympics in Beijing wore the sneaker. It became Nike’s purest basketball shoe, a model built for basketball players of all shapes and sizes and styles of play. Fast forward eight years and several iterations of the shoe later and a new Hyperdunk model was created that made its debut on the world stage. The 2016 Nike Hyperdunk 2016 Elite ($200 retail) was designed by Leo Chang, an icon in sneaker circles. Chang has been the lead designer for Kevin Durant’s KD and Kyrie Irving’s Kyrie line since the onset and has had his hand in the previous Hyperdunk models. When you’re on the basketball court, the most unsettling feeling is wearing a shoe that doesn’t support your movements. The Hyperdunk 2016 elite features a multidirectional tread pattern on the outsole, with several zones where it runs perpendicular. The result is good, albeit short-lived, court grip. The translucent outsole material was a magnet for dirt court grime, so extra wipes between games and down time are a must. 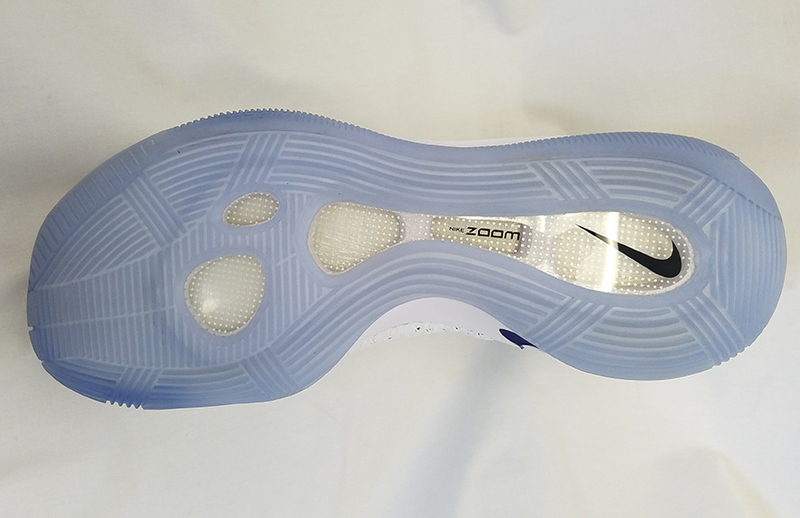 As a bonus, the outsole runs up the medial forefoot, giving players some more traction during cuts and push-offs from the inside of the foot. The Hyperdunk 2016 features a full-length Zoom Air unit that sits directly underneath the foot and incorporates a hollow core between the unit and the outsole. This gives you almost a trampoline-like effect while running and jumping since the removal of material exerts more pressure to the Zoom. Since the Zoom is toe to heel, it’s very adaptable to all players. A bigger player will appreciate the overall shock absorption while smaller players will like the responsiveness that the forefoot provides. When designing this shoe, Chang had a vision to make a product that paid homage to the original 2008 Hyperdunk, while leveraging Nike’s latest and greatest technology. This was the inspiration behind the full Flyknit upper of the Hyperdunk. “Going into the design of the 2016 model, I wanted to re-revolutionize the upper technology by bringing Flyknit to it, much like we did with Flywire back in the day,” says Chang. The result is a shoe that feels as if you’re actually wearing a sock. Once laced up, the knitted, woven upper conforms to your foot, giving you an unparalleled feeling of one-to-one comfort and stability. Additionally, the heel counter from the original Hyperdunk was incorporated, a pragmatic homage to the past that keeps your foot snugly inside the shoe as you perform. Initially, it seems like the high Flyknit “sock” of the Hyperdunk would be tight and a pain to get in and out of, especially if a high sock is worn, but it does not impede at all. 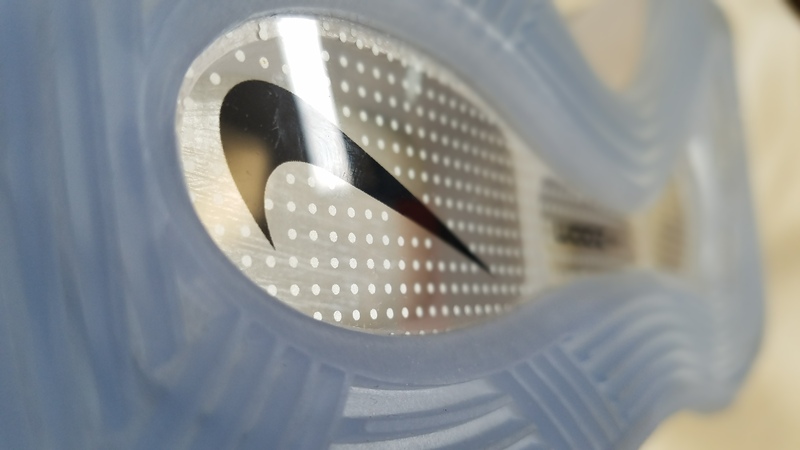 Nike made the Flyknit material in that area with high elasticity. It never felt too tight—it was barely noticeable—whether wearing socks that ran above and below the height of the shoe. Even with lower socks, we didn’t experience any chafing from the material on exposed skin. Additionally, you can roll the collar down, giving the shoe a slightly different look while also exposing a pull tab (more form than function since it was on the small side). This one can be a bit tricky, depending on the kind of socks you choose to wear. However, the shoe itself seems to run true-to-size on our testing. As mentioned, the sock collar of the shoe is very flexible, comfortably accommodating most feet. The Flyknit material will initially feel loose, but with time and wears, will conform to feet. 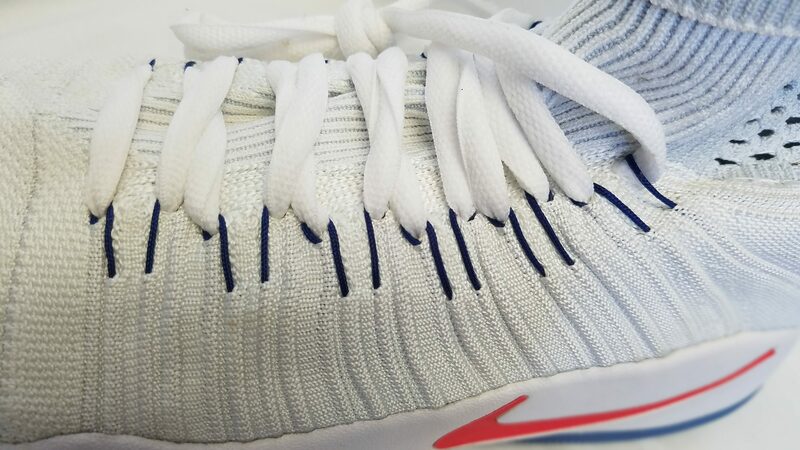 Like with many woven upper shoes, lacing is slightly tougher as the laces get caught on the Flywire eyelets (the Flywire frame sits underneath the Klyknit). It will require some more effort the first time you lace them up and some midgame adjustments on the laces should be expected. But on the other hand, the Flyrie/Flyknit combo keeps your foot encased with minimal lace-tightening. The full Flyknit upper on the Hyperdunk 2016 makes trying on the shoe first a necessity. However, once you find your fit, the shoe itself is pretty stable in terms of locking down your foot when playing. 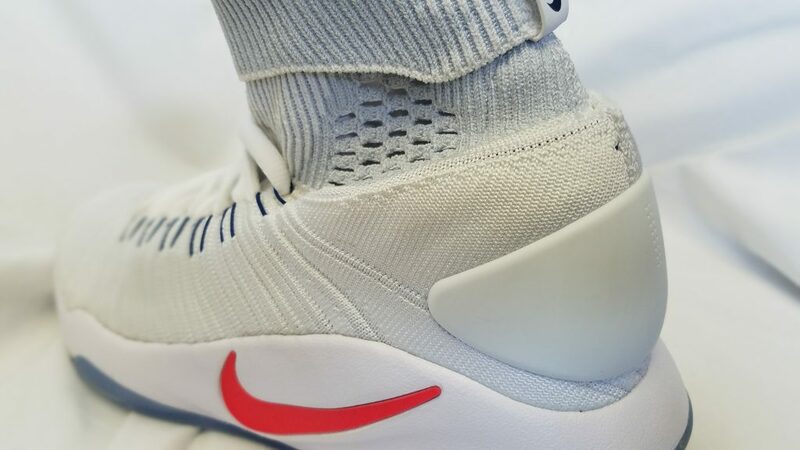 There is some sliding inside the shoe, albeit minimal, and the only drawback from the Flyknit upper is at the toe, where if you get your foot stepped on, you can really feel the pressure and impact of it. But based on previous woven-upper shoes, this lessens in time. The shoe does a good job of keeping your foot on the footbed, and a tight lace job will keep the lateral sliding to a barely noticeable minimum. Much like its great-great grandfather, the Hyperdunk 2008, the Hyperdunk 2016 is a finely crafted basketball offering that will satisfy most hoopers. It was designed to reach the widest basketball-playing audience and the end result is a basketball shoe that ticks most of the checkmarks. It doesn’t exactly excel in any one area, but gets high grades across the board. The same is true for the Hyperdunk 2016’s design. It’s not exactly over the top and won’t break any necks, but there’s nothing to turn off anyone either. That said, the Flyknit version (there is a non-Flyknit version available) does add flair to the Hyperdunk, but at a $60 premium. The 2008 Hyperdunk was a long favorite to hoop in for its versatility and dependability. The 2016 Hyperdunk looks to carry on that same lineage. We only tested the Flyknit version for this review.